It’s that time again, the 2017 Market Driven Education Industry Group’s 6th annual survey, in conjunction with Edufficient, one of the fasting growing EDU-specific Performance Marketing Agencies has arrived. This survey has become a standard for the industry, bringing together Schools, Lead Providers & Agencies, helping to create an updated master list of industry service providers. Hundreds of screened participants help make this a valuable tool for all those who participate. All participants are reviewed for accuracy & relevance to the industry. You must complete 75% of the survey questions to qualify and receive results! All requests for survey results from non-participants will be denied! Service providers contact information must be accurate to qualify. Remember, schools will receive your contact information so they can contact you, so please double check for accuracy. All School contact information is private and will not be distributed. Only vendor info will be made available to participating schools. 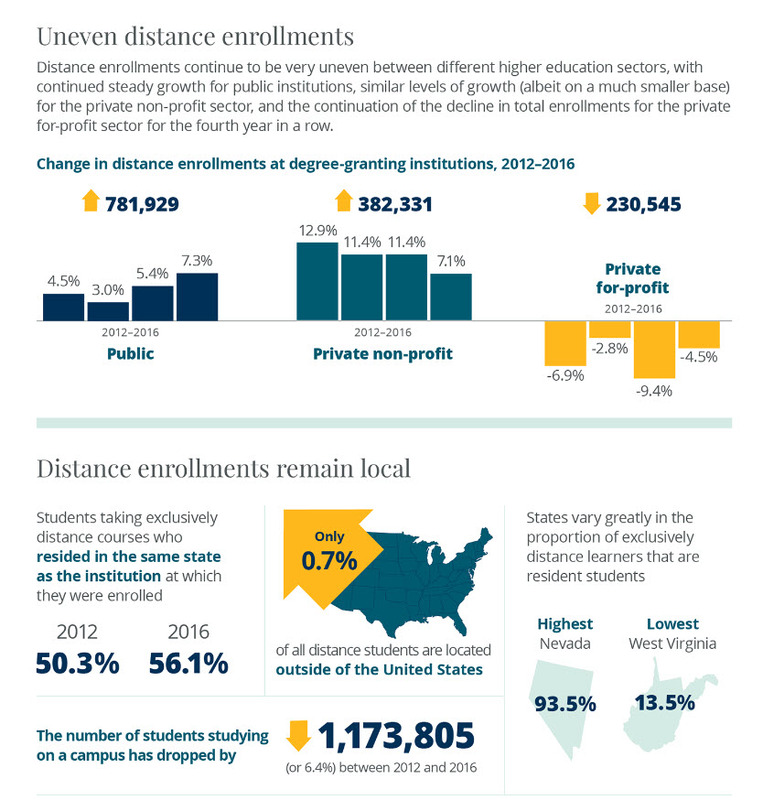 Overall Student Demand for Higher Education has Dipped an Average of 8% Year-Over-Year in 2016. 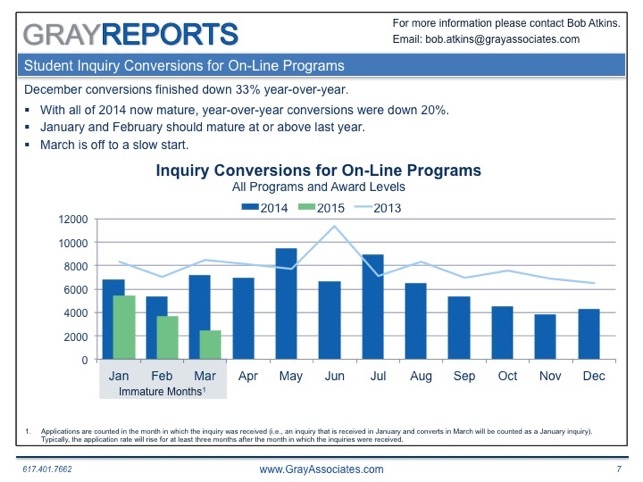 2014 Conversions for On-Line Programs Crumble: 20% Behind Year-Ago Levels. The Slowing Slowdown: Inquiries Only Fell 9% in February. Finally! National Inquiry Volumes Rise in December. 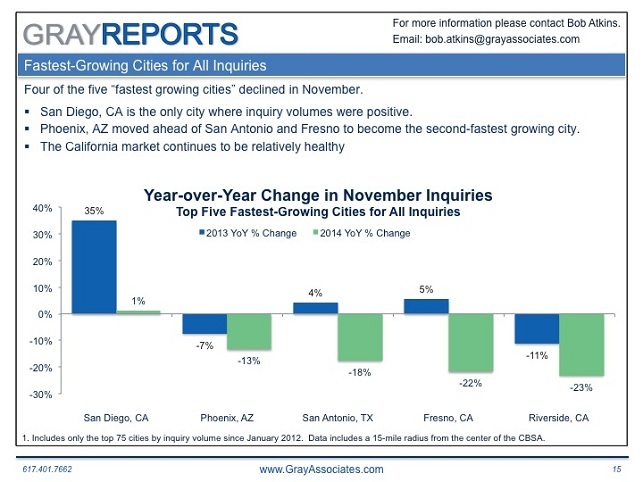 The Fastest Growing City in November 2014? San Diego. 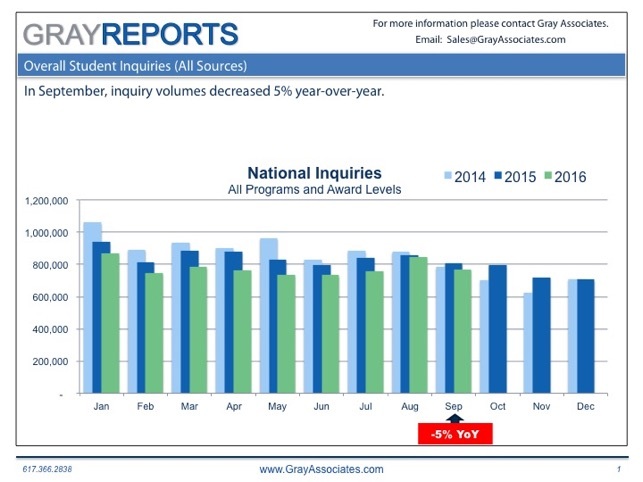 While demand in the industry remains soft, Gray Associates forecasts that conversions for August and September will meet or beat 2013. GrayReports’ sample of nearly 32 million inquiries suggests that there is a rapid decline in inquiries for on-line programs, but relatively stable inquiry volume for on-ground programs. We are also seeing a shift to higher-converting inquiries. Recently, PPI volumes have dropped sharply, while internally-generated inquiries have risen. As inquiries for on-ground programs and internally-generated inquiries gain share, conversion rates are rising. So, while overall inquiry volume is down, converted inquiries are on the rise. Inquiries for on-line programs continue to lose share. 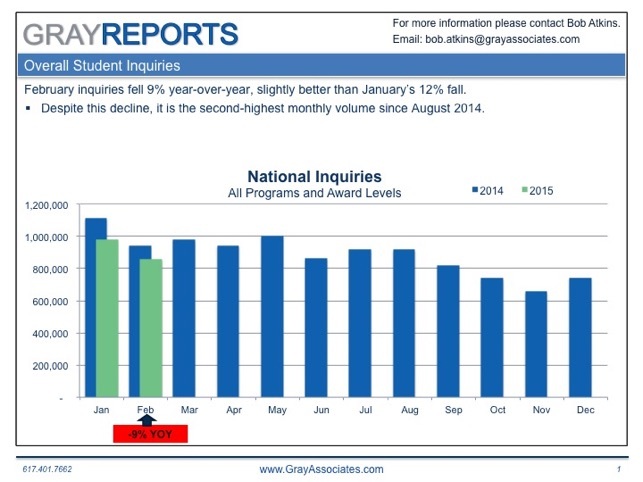 So far in 2014, inquiries for on-line programs have dropped 23% YoY. In July, they were down over 24.5% YoY. Inquiries for on-ground programs remain a bright spot. 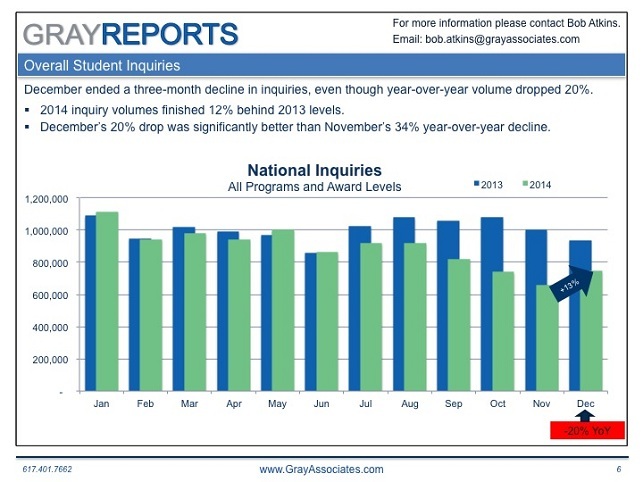 The first seven months of 2014 have produced a 7.6% year-over-year increase in inquiries. The second quarter of 2014 outperformed Q2 2013 by 17.7%. July is the first month in the past six that did not outperform 2013. July recorded a very modest 1% decline in 2014. Internal inquiries are gaining share. From January through March internal inquiries were stable versus last year. April, May, and June all reported year-over-year increases of greater than 20%. In July, internal inquiry share jumped 81% year-over-year to almost 30% of our sample. Inquiry-to-application conversion rates have strengthened in recent months. The first four months of 2014 are mature and have outperformed 2013. May 2014 is nearly mature and has already outperformed 2013 by 12.4%. July is starting strong and if the trend from the rest of the year holds it should outperform 2013. April had the lowest year-over-year growth thus far of 5.6%. May still has the opportunity to improve but is already up 8.2% over last year. Exclusive 20% Discount for the MarketDrivenEDU community! Develop your skills, build your personal brand and position yourself for growth at ad:tech New York 2014. On November 5 and 6, the marketing, technology and media communities will come together at the Javits Center to find top notch solutions, network with the best industry players, and stay abreast of the emerging trends in the marketplace. With a rapidly changing digital landscape and new challenges on the horizon, the traditional rules of attracting the right consumers are no longer relevant. Optimization and creativity served using a multichannel strategy is the expectation for the future of marketing’s best and brightest. Take advantage of 225+ technology solution providers, five keynotes led by industry thought leaders, NEXT interactive display and startups, re-wired tracks featuring the hottest topics, 30 enhanced sessions with new speaker formats, face-to-face networking and much more!